Custom What's in my Bag Portrait Illustration Art Poster. A listing of one custom one of a kind illustration of your favorite bag and it's contents... your defining personal items! I would just love to draw one of these drawings for you. 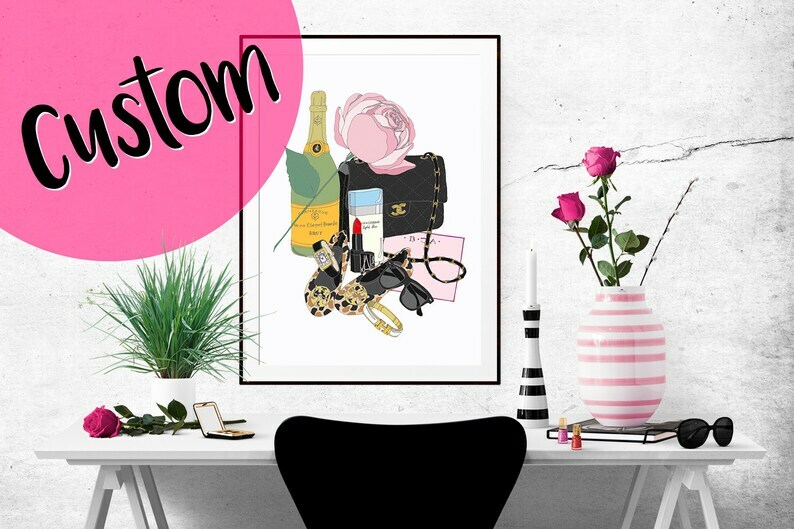 Your personalized illustration can include your favorite purse and up to 10 accessories or so (depending on size of your favorite things). Illustration usually takes about 1-2 weeks to create. Please convo me for more information or with any questions. Visit my What's in my Bag Pinterest Board to get a little inspiration of completed custom projects. Professionally printed on satin matte paper as well as signed and dated by the artist. Rolled in tissue and sent with care in a cardboard poster tube. Made with love! I love this. I saw it months ago and never actually ordered it, but never stopped thinking about it. I’m so happy it’s in my home. Spedizione puntuale ....mi piace molto l'oggetto. Buona esperienza con la proprietaria del negozio che è stata veloce nel rispondere ed esauriente.